Chapin Sprayers and Spreaders are made from the best materials and exceed the most exacting industry standards. Our sprayers and spreaders continue to perform safely and dependably, providing years of reliable service. Over the years, uses and applications for Chapin sprayers have increased as more people discover the ease and convenience of performing a wide range of tasks with a pressurized sprayer. To meet this demand, Chapin has created sprayers that specialize in specific uses as well as sprayers designed for multiple jobs. Today, the Chapin family of sprayers includes metal Tri-Poxy® and stainless steel sprayers, polyethylene sprayers, backpack sprayers, hand sprayers and dusters, deck and wallpaper sprayers, pest control sprayers, industrial sprayers, construction sprayers, cleaning and degreasing sprayers, light duty sprayers, professional sprayers, slide pump and cart sprayers, and drum pump sprayers. No matter which Chapin sprayer you choose, you can be assured you’re getting value, versatility, quality, convenience, strength, durability and responsive customer support service that’s second to none. 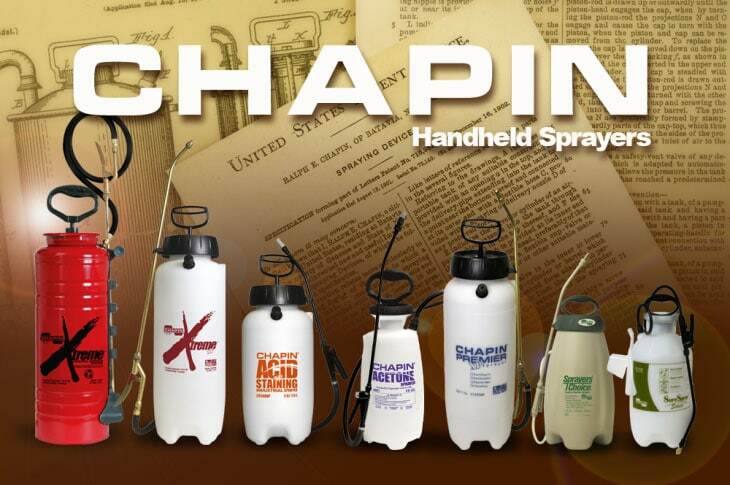 Chapin sprayers can be found in many applications throughout the world, both with the familiar Chapin logo as well as under private label. As we head into the third century in which we’ve been in business, we’re proud of our technological accomplishments and continuing customer satisfaction. We pledge to continue our commitment to the impeccable standards of product quality for which the Chapin name has long been known and recognized worldwide.